Putting stuff in pigeonholes is a typical response to discovering anything new. 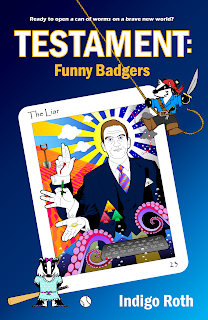 For example, when I saw two dozen badgers doing a rehearsal of a synchronised dancing and swimming routine in the garden pond, I immediately filed it under New Wave Buzby Berkley. Shallow of me, I know. So, when I tell folk how much I like the new album by Turtle Soup, they always ask me what it's like. But despite all my years of pigeonholing things, I never have a clear answer; it's terrific stuff, and hard to categorise. This piccy (L to R: Roger, Fran, Phil, Steve) is one of mine, and sans logo might be used by the band at some point. By the way, the picture is definitely worth a click. Lots of cool detail. The new album, their second, is called Never Alone. Six tracks, dark and elusive, and very rewarding. And ahead of the album's CD release, the band have decided to make all of the tracks available to listen to; just click here to launch their website. But can I pigeonhole it, musically? I know you want me to. Well, I sometimes say it's folky, but less so than their first offering. And sometimes I say it's alternative, but that's more of a battered bucket than a useful description. I think the offical music biz line is that it's progressive folk, but the best description I can think of is that it's bloody marvellous! That gets people's attention. And better yet, it's true. Right, the badgers are filming tomorrow, so early to bed. First off, awesome pic Indigo! Second, I DID go to their website, and she has a beautiful voice! Marvelous artwork, Indigo! And thanks for the tip... they have a great sound! In fact, I liked it so much I just bought the album on iTunes. Hey Kato! She does indeed, and is a lovely person too. BTW, I hope you saw the update - go buy it, darling, BUUUUY! Hey CatLady! Glad you liked it enough to Push. The. Button. And I know Fran and the band will too! I bought and downloaded from Amazon this afternoon. You did the pic? Well done! 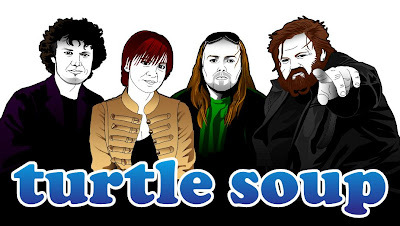 I've added "Turtle Soup" to my list of things what I will download from iTunes next. I enjoyed this post. Never trust badgers in water though. Very cynical sometimes they are. Especially if they've been drinking. I enjoyed the link to the group. I thought her voice had shades of Maggie Reilly in it. Hi Alistair! These were badger cubs/kits, and ne'er a drop has passed their lips. Their director, Yavin, likes a jar of real ale and a pipe of good tobacco, but he's also known for his moderation. They're a good clan! Hey Robbie! They are indeed, and rather splendid on last Sunday in Southend! As for PowerPoint, I like it for drawing. Not the recent (2007/2010) versions, mind. PowerPoint 97/2000 are the real deal for me.